Up-and-coming female cricket star Sarah Bryce admits she was shocked when she was called into the Watsonians first XI earlier this month, but is loving being part of their Masterton Trophy campaign. To date, the 18-year-old wicketkeeper has played in the two group wins over Edinburgh and Stewart’s Melville and she is set to be involved again in the Twenty20 event this evening when the Capital club host Musselburgh at Myreside. Over the years, a number of female players have played top-team cricket throughout the country, but it says something for Bryce’s talent that she has been given such a key role in a men’s team at such a young age. With her older sister Kathryn now the Scotland Women’s captain and Sarah a regular in the squad, they have big futures in the game. Their love of the sport comes from their father James and the girls used to play for fun in the back garden before Kathryn took cricket up at school. The rest, as they say, is history and certainly Bryce junior has not looked out of place in her two top-team showings to date, taking a catch in last week’s victory against Stewart’s Melville. “I am currently on a gap year and trying to play as much cricket as I can,” the former George Watson’s College pupil said. “However, I was surprised to get a text message from [Watsonians captain] Ewan Chalmers a few weeks ago telling me that he wanted me to play in the opening game of the Masterton Trophy. “I think the main thing to get used to in that game was that the ball hits the gloves just that bit harder than I am used to when keeping wicket because some of the bowlers are a bit faster, but the team were all great with me and helped me settle in. After the 11-run win over Edinburgh on May 1 at Campbell Park, Bryce and co defeated Stewart’s Melville by 52 runs last Thursday and, as mentioned, she took her first top team catch off the bowling of 16-year-old Callum Macleod who was making his debut. 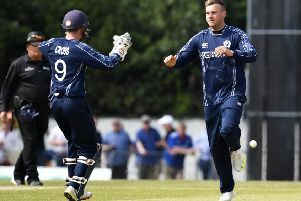 “It was nice to take a catch in that game, but as a wicketkeeper you have to be switched on every ball and you are always involved so I am looking forward to the Musselburgh game and then maybe more Masterton outings in the coming weeks, we’ll just have to wait and see,” Bryce explained. As well as being handy behind the stumps Bryce – who spent four months in Australia honing her cricketing talents over the winter – is also a very competent batswoman. Alongside the two Masterton games she has played the first three East League One matches of the summer for Watsonians second team and at the weekend hit 25 not out in their comfortable win over Holy Cross. She has also played in the Scotland Wildcats ‘A’ three victories to date in ECB Women’s Division Three. That include spending the entire weekend of May 5 and 6 in the middle, the stellar sting stint included a match-winning 80 not out against Durham, 41 not out against Northumberland and keeping wicket for a combined 92 overs. “It has been a busy start to the summer with my cricket, but that is what I was wanting and I just have to keep trying to improve,” she concluded.